My mother cut this recipe for a whole wheat loaf of bread out of the local paper. I remember she sent it to me when I was young and poor. Those were the days when I baked my own bread, made yogurt, grew sprouts and the brownies included you-know-what. 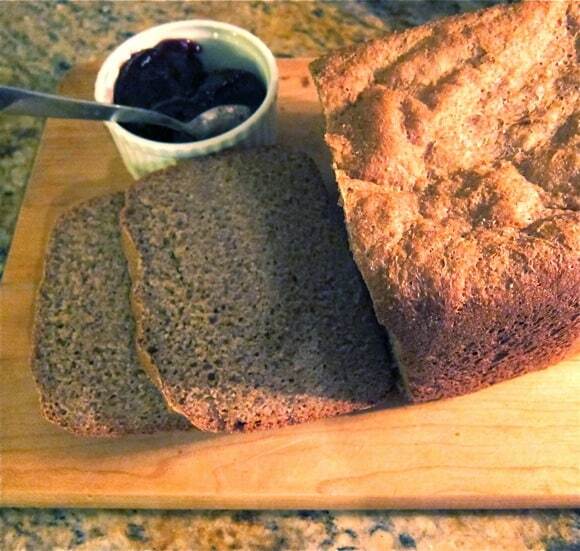 This is a perfect bread recipe for the novice baker. After a long absence, I remade friends with yeast yesterday and think I’ll try to make this more of a habit. 1. In medium saucepan, heat first three ingredients until warm – 110 to 115 degrees. 2. In large bowl, combine warm liquid, 2 cups of the unbleached flour, honey, salt, cinnamon, nutmeg and yeast. Beat 4 minutes at medium speed. 3. By hand, stir in whole wheat flour, oats and remaining 1 1/2 cups of unbleached flour. 4. On well-floured surface, knead dough until smooth and elastic, about 5 minutes. Place in greased bowl and cover with dish towel. Let rise in warm place 25 minutes. 5. Grease two loaf pans. 6. Punch down dough; divide and shape into 2 loaves. Place in greased pans. Brush with oil or melted butter. Cover with clean dish towel. Let rise in warm place until doubled in size, about 30-40 minutes. 7. Preheat oven to 350 degrees for glass baking pans, 375 degrees for metal. 8. Bake 40 to 45 minutes, until golden brown. Loaf will sound hollow when lightly tapped. If bread becomes too brown during the baking, cover with foil for final 10 minutes. Remove from pans and cool on racks. Great meeting you at Camp! Those were the days…Thank goodness they are in the past now 😉 Lovely to meet you, Sara! So happy to finally meet you face to face, Liz. Yes, it’s really good to be reminded about baking with yeast every once and a while. Sorry I left early, worried about my husband post MI. So pleased to meet you! !